It’s convention season! There are homeschool conventions all across the country at this time of year. And I have to admit that I’ve attended more than my fair share of conventions. I’ve attended conventions in a total of six different states. I love me a homeschool convention! So whether you’ve never attended a convention or you are a convention hall veteran, it’s important to understand the types of conventions and ask yourself if it’s worth the time and expense to attend. First, know that there are different types of conventions. Some conventions are not-for-profit while other conventions are. When choosing a curriculum to attend, it’s important to investigate where all the admissions fees go. Some conventions are hosted by a state homeschooling organization and the fees offset the costs of running the organization and advocating for homeschooling across the state. Other conventions are hosted by religious organizations. And, yet another type of convention is run by for-profit companies. 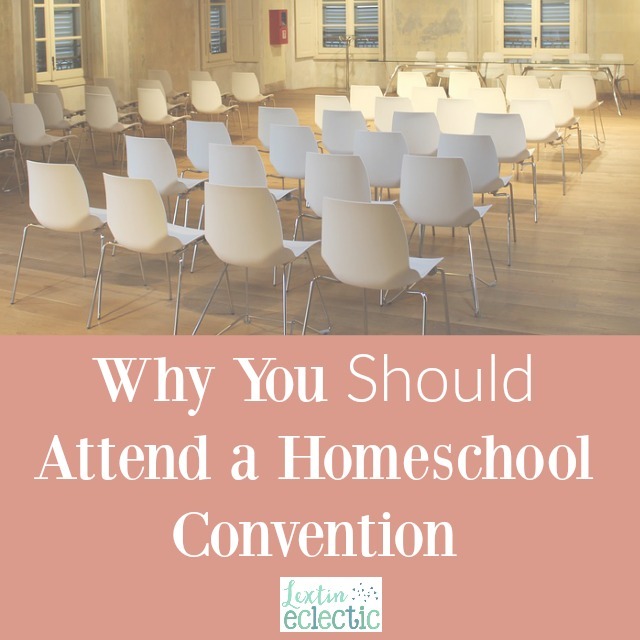 I personally try to attend conventions that are supporting homeschool advocacy and serve as a resource for local families – spreading the word about homeschool events and connecting families to support groups and co-ops. So, should you attend a homeschool convention? I highly encourage you to attend one this year – especially if the convention is supporting an organization that advocates for homeschool freedoms. So, by attending one of these conventions, it benefits all the homeschool families in your area. How does attending a convention benefit you? Homeschool conventions are packed with informational and educational workshops. You can learn more about teaching a specific subject or about certain teaching and learning styles. There are workshops that cover parenting topics and even workshops that are meant to encourage you in your homeschool journey. You will come home armed with lots of new ideas and feel motivated to dive into a new homeschool year. A homeschool convention is a great way to connect with other homeschool families in your area. Many local companies have booths at the convention and you can learn more about the various programs and course offerings in your area. It’s a great way to learn about all the resources available to you as a homeschool family. Don’t forget to shop in the huge vendor halls. There are multiple curriculum and book vendors, and you’ll have the chance to page through their books and make decisions about resources for your homeschool year. Many of these vendors offer great discounts as well. I often treat a homeschool convention as a mini-vacation for myself. I attend the conventions without my kids and spend a day or two being refreshed and encouraged. And I will never turn down the chance to shop by myself, especially if I’m shopping for my favorite thing – books! I find that a one- or two-day homeschool conventions are sanity-saving for me. Will you be attending a homeschool convention this year? I hope you have the chance to be refreshed and encouraged through attending.